Racine Journal Times (By Aaron Knapp) – The Racine-area native returned to The Prairie School, 4050 Lighthouse Drive, last week to perform alongside students during a multimedia concert entitled “Prairie School” Saturday, during which the high school orchestra accompanied her on a piece of Irish and classical fusion. The concert is one of numerous performances scheduled this year that will bring Prairie alumni back to artistically celebrate the 50th anniversary of the school, according to Pat Badger, performing arts chair at Prairie and a teacher there for more than 40 years. These visits also include workshops during which students can interact with artists who started out in the same school. “The students here, 20 years from now I hope they go ‘wow, somebody at my school who graduated from there, they came back and played music with me. How cool is that?,’ ” Badger said. 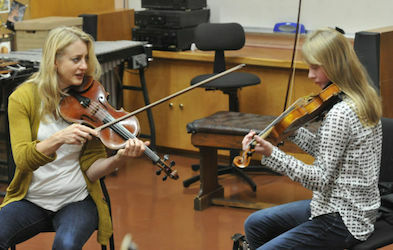 Martin Bixler began playing violin when she was 8 years old and was a student of Badger’s when she attended Prairie. This entry was posted in All News, All School, Featured, Performing Arts by Communications Department. Bookmark the permalink.